LANKS is Melbourne singer-songwriter and producer Will Cuming. 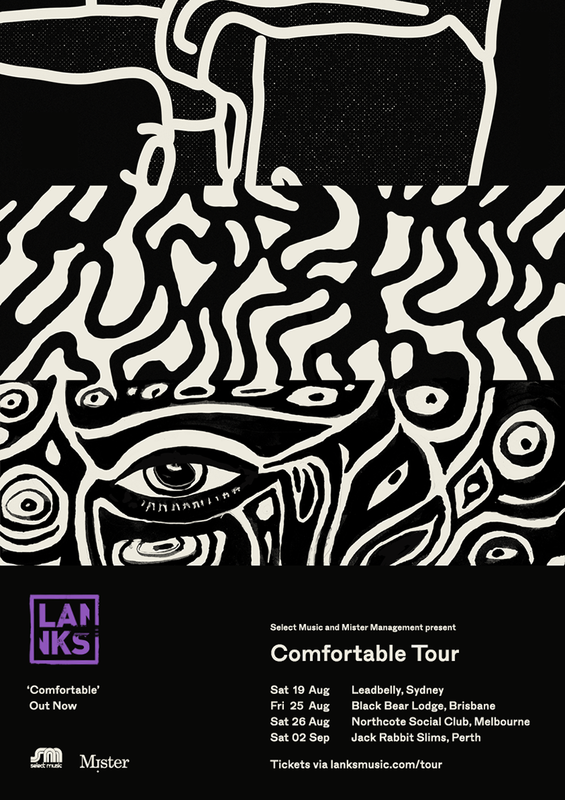 In unusual style, LANKS’ songs evoke folk storytelling within the framework of electronic music. What links the songs is a natural narrative – drifting between tales of vengeful samurais, desert bandits and the lonely deep sea, to the suburban mundane – lost love and daydreams of paradise. Futuremag Music: Firstly, congratulations on the release of your latest single Comfortable. It’s quite a progression both in production and lyrics from your last releases, was this one born around the same time as your last EP or is it more of a reflection of your creative processes since that release? LANKS: Comfortable was written much later than the last works, in March this year. Once I knew what it was I was making and what I was making it about it came together really quickly. Written and finished within a week basically, which is when we played it live for the first time. The process was still similar, I'm just learning how to dive deeper and am improving I think. Futuremag Music: You’ve clearly been developing and giving more attention to your lyrics over the past few years, has this happened naturally or was that an intentional progression in your song writing? Are there any lyrics that you’ve written that stand out as your favourite? LANKS: It has been happening naturally as I have written so many lyrics, but I have been very conscious of writing work that means something to me and actually says something now. Whereas originally, i was more concerned with the musical puzzle and moods I was creating, now I think every element is important basically. Every single detail matters. One of the lyrics I love that I wrote was from my last EP, on April. "She only cried a whisper, but in my ears it thundered." Breaks my heart every time I hear it again. Futuremag Music: You’ve been in the live music scene for quite a long time, have you noticed your performances change and evolve in time, over the past 12 months in particular? LANKS: Yes, absolutely. Still very much a work in progress but I'm really just getting comfortable performing more. I always could play my instruments with ease on stage cause I've done that so many times. But I'm starting to be able to perform better and even do it without a guitar in my hands. It's fun performing without an instrument now, all the guest vocals I have done for Just a Gent, Kilter, KLP, and Kite String Tangle have helped me learn that. Futuremag Music: It seems that you, and a lot of artists at the moment, are caring less about conforming to particular genres. Do you take genre into consideration when you’re writing or is it becoming increasingly less important? LANKS: I don't really think about it. I never even fully understood genres anyway. I'm just searching for sounds that make me feel something and are interesting to me in some way. I love so many styles of music and am always looking for something fresh and unknown to me which is the most rewarding listening/creating experience. Futuremag Music: You seem to be really fond of collaboration both musically with artists like Woodes and Airling, but also in the other elements of the Lanks project. What is it about collaboration with other artists in your music and also your album artwork and film clips that keeps you coming back? LANKS: I actually don't think I have done enough of it in the LANKS project. But I have been doing a lot more writing/production with other artists for their stuff. It is amazing! Can't speak highly enough of the talented artists I get to spend time with. I learn so much from every single one of them. They push you out of your own zone too which is the best. And it's always nice to connect with other artists. Futuremag Music: You’ve got your national tour coming up just around the corner in support of Comfortable, but what else can we expect to see from you? Will we be getting a bigger body of work from you anytime soon? Perhaps some more collaborations? LANKS: There are lots of things on the horizon that I can't yet speak of. My hands aren't idle for long before I need to create again. I've written a lot of songs this year so hopefully you get to hear some stuff soon.